Chili Piper will often push updates to the Chili Piper Chrome Extension to resolve issues that may appear. However, it can sometimes take your browser a few hours or days to update. If you're ever having problems with the Chrome Extension or suggested times in email, you'll want to make sure your Chrome Extension is using the latest version. 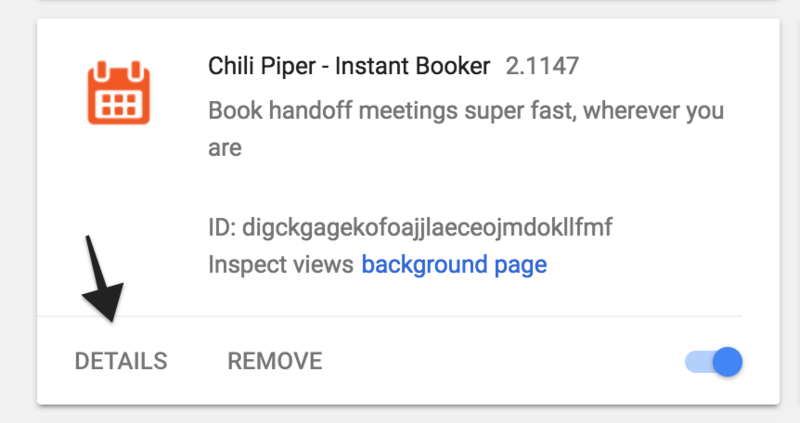 Step 3: Find the Chili Piper Chrome Extension and click "Details"
Step 4: Click the "UPDATE" button and your Chili Piper Chrome Extension will be updated to the latest version. That's it. Go check to see if your problem is fixed. If you problems persist, please email support@chilipiper.com.